Our solid crate top allows personal items to be stored on top, taking full advantage of the surface area with no effect on the crate or pet inside. Panels cover the main components of the crate giving the crate a more finished and interior-appropriate appearance like furniture. Available in three sizes to accomodate a pet of any size. External: 32.5" x 21.5" x 23.5", Internal: 30" x 19" x 21" and Door: 15" x 13"
Style and functionality come together in one with the Merry Products Cage with Crate Cover Set. The set comes with black powder-coated fully functional free standing steel crate and a Mahogany brown elegantly designed solid wood cover. The cover turns an ordinary pet crate into an attractive and functional side table for your living room, family room and/or bedroom. The metal crate also comes with a removable plastic tray at the bottom of the crate for easy cleaning. In addition, a removable stainless steel crate divider is included allowing for partitioning of the interior space for successful crate training of your puppies. 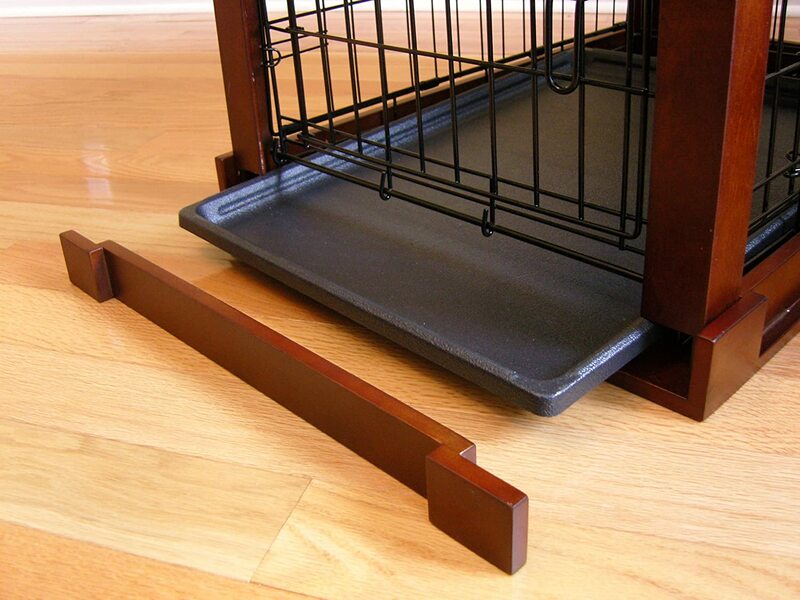 This remarkable cage with crate cover comes in 3 different sizes to accommodate most dog breeds. Extremely easy assembly and dis-assembly, no hardware is required. Design patent granted.